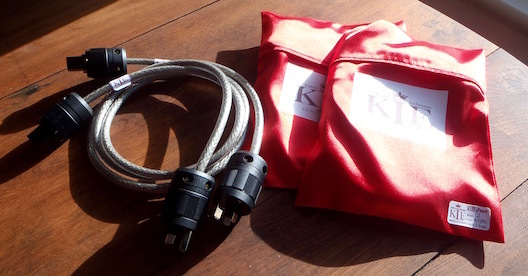 If you make only one improvement to your music system this year, the new AC cable from KLEI (Keith Loius Eichmann Innovations) should be it. Let's get straight to the point - this cable will dramatically improve the performance of almost every system - and given it is just NZ$500 for 1m, I know of no other way to do so much for so little - this is regardless of the type or cost of system. In short, if you have any audio component with a standard size detachable power cable, the new KLEI AC cable is for you. This is an absolutely no-risk purchase - just plug it in and listen. If you can bring yourself to send it back I'll happily refund you - I know all the KLEI cables get better with use, so we're hardly getting the short end of the stick. It's over thirteen years since we got Keith's original AC cable - here's our archived page on it - which was deservedly popular. So much has happened since - Digital has become far, far better, there have been some radical developments in amplifier design and let's not even start to talk about the impact of the iPhone and wireless. Analogue has more than kept up with the pace. So our expectations are higher in every regard. I also know our clients have enquiring minds and know better than to accept any claim at face value. So I've been not just doing a lot of listening before the launch of this cable, but also my own research on all the options out there, the state of play in terms of knowledge of AC cable design. And bouncing a good number of e mails between Keith and myself. Why do you need a better mains cable? As we've already pointed out, a lot has changed in 9 years. With the ubiquity of wifi and the proliferation of electronic devices - some with profoundly negative effects such as new lighting systems, it doesn't take much of a stretch to realise that there are challenges in terms of power supply interference that simply didn't exist before and in all probability almost every part of your audio system is affected. On a more positive slant, the improvements made to a broad range of components mean your system is likely to be more transparent and responsive than ever before. We're also getting new components through that are delivering a fantastic level of performance for far less than before. And the best of the higher cost components are close to mind bending in their abilities. So it's into this environment that we're placing the new KLEI AC cables - more problems to be solved but also more gains to be made. It doesn't matter what age or performance level your system presently sits at - there is a dramatic and worthwhile improvement to be had with no downside. Other than the addictive nature of discovering that if one cable delivers, two are going to be even better. But that's something I'll go into later. If you're reading this, I'll take it as a given that you accept that better quality audio interconnect cables make your system sound better. You'll also understand that the signal coming though the cable is not a continuous flow of DC - direct current - but a complex AC signal varying widely in both frequency and amplitude. Likewise the power coming into your component is AC and the demand as music is playing is dynamically changing. So there is plenty in common between interconnect and power cable design. And Keith Eichmann has experience in both as well as being responsible for a series of groundbreaking innovations such as the original Bullet Plug. 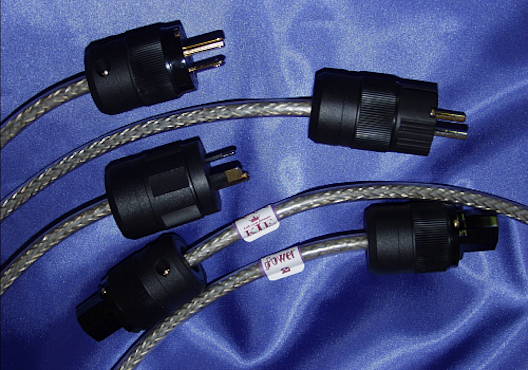 These cables are developed with the same 240v, 50Hz AC power that runs every amplifier in New Zealand, Australia and the UK. While there is no doubt that many US designed cables are also very well designed and reviewed, it is important to understand that this is within the context of their 120v, 60Hz system, and there are significant differences. In the last five or six years there has been an explosion of high quality mains cables coming on to the market - but this has largely bypassed New Zealand and Australia due to both the lack of the right mains plugs and compliance issues with voltage. The upside of this is that we're now stepping in at a much higher level rather than having to go through a series of incremental steps. The standard AC power cables supplied with almost all components are strangling the performance of your system. With the original Eichmann AC cable, there was the suggestion that it worked best with high demand components such as amplifiers - it never took too much of a conceptual leap to understand that a better flow of power in would result in a more pleasing flow of music out. How the new KLEI mains cable works. There is however much more to the story with the new KLEI AC cable - in part, Keith's work on his gZero series interconnects where there is particular attention paid to termination, grounding and screening, has migrated over to the AC cable design. The voltages are obviously greater but so too is the benefit of better grounding and elimination of noise generated. The development of this cable has taken years. When Keith launched KLEI and we contacted him, the introduction of a new AC cable was part of the conversation and this has since been continuous. In the last two months I've been lucky enough to get to play with the final pre-production versions, and even with these there have been significant improvements made. We know from interconnects that the termination of any cable makes a significant contribution to its performance - this has now been established to be the case with mains cable. There are two Japanese companies that lead in audio grade AC plugs. The first prototype Keith sent me had what I understood to be the only audiophile level NZ mains plug, the Furutech AU3122 on one end and a customised version of the highly regarded Oyaide P-046 IEC socket at the component end. The next was Oyaide at both ends which sounds markedly better. The final production version is even better with the arrival of KLEIs own plugs - these have been designed in accordance with Keiths gPOWER Live/Neutral/Ground Formula and a very high level of both material and finish specification. Keith's unique approach to using differing materials for conductors is in evidence - Both plugs have been custom made especially for KLEI with phase and neutral terminals have their own plating. Gold on the earth and neutral, and what I'm picking as Rhodium on the phase. The cable itself gives fewer clues as I've only opened the plugs up, rather than dissembling the cable, but I'd suspect there is as much care taken with the selection of the conductors as the plugs. Keith tells me that he's using both mathematical and material considerations in the selection of the cable - so while we don't know all the secrets, I think it's a safe assumption that the internal cable is carefully chosen for its properties and its likely there are significant differences between the phase and neutral conductors. This is similar in concept to the gZero architecture employed in the KLEI audio interconnects - It doesn't take too much sleuthing to see that the cost of these plugs is substantial and given that each has been uniquely made for KLEI (remember the differing plating on phase and neutral), I'm surprised the price of even the entry level cable isn't significantly higher. The most immediate and obvious quality improvement I heard when first auditioning this cable was greatly increased lucidity - everything about the music seemed to come alive, with greater contrast and markedly better definition - if I hadn't heard this myself, I would not have believed how great an impact this made. Let me place this in context for you - I'd intentionally down-scaled our home system and while there is a fairly seriously set up analogue front end with Well Tempered, Dynavector, Pure Audio and KLEI cabling components, this was all running into a very modest little NuForce analogue preamplifier - the HAP-100 - which was what we first plugged the KLEI AC cable in to. The magnitude of the improvement made was far greater than the original Eichmann AC cable - at the time I felt that this was broadly equivalent to jumping up a model in any given range of amplifiers. But the new cable is night and day - it's like going from an entry level component to the high end in one remarkable jump - the changes made are more than subtle improvements in some characteristics - it's a wholesale reconstruction of the sound taking it from adequate to captivating. Yet this was really only the start. We know from experience that many components and cables take little time to settle in - especially from new. But with the KLEI products (and new digital components from NuPrime) this process is both more extended and greater in terms of the gains to be had - over days and weeks there is continual improvement. I've found exactly the same applies with this mains cable - in part this may be because I've come to expect it and am looking for a progression of gains rather than just a one off improvement. What the KLEI cable does is create a much more transparent performance from every system in which we have tried it - the background hash is greatly reduced but this is also accompanied by a significant increase in lucidity - there is simply a whole lot more going on, top to bottom, loud to quiet. This feeds through into the quality we describe as 'pace'. With more going on, it sounds as if the music is playing faster - not in a helium induced cartoon sense but as an increased sense of drive and immediacy. That live sound where you can't help but start to shimmy around even if you're sitting down. Because we can now hear much more, improvements that might have seemed subtle before are now thrown into sharp relief. So both the initial burn in and settle in period when the cable is tried with a different component or system becomes much more obvious. Taking the KLEI cable out and going back to the standard cable is strictly for masochists - everything goes horribly flat, slow and dull. I've been torn over the period of only having the one prototype cable - I've been trying it with as many components as possible which means every time it leaves home, our system becomes a shadow of what it was. I'm finding this hard to explain as we're constantly changing other components. Each change alters parts of the sound and you can hear a specific character with most components - yet this power cable seems to influence almost every aspect of the sound. With the new NuPrime products we've been made very aware of the virtues of both low noise and high resolution (they aren't the same) - the KLEI cable provides an enhancement to both sides of this equation. In our introduction I did suggest that the increase in outside sources of interference is a real issue - we know in our (rural) home environment that we have a lot less exposure than in the shop as pretty much everything seems to sound better at home and we're able to pick much more subtle differences. But the performance of the cable is consistent in both home and shop, so what its doing is not dictated by environment. As well as dealing with outside interference it must also be doing something directly with the component or system it is connected to. This ties in with the suggestion we've read that most of the EMI that affects the audio quality of a system is generated by the audio components themselves: A primary source of audible sonic degradation is caused by the power supplies in our audio/video components. Most components use FWBR (full wave bridge rectifier) power supplies that generate an incredible amount of transient noise when the rectifiers switch off. The design of a power cable can significantly affect the reactance of these signals within the power supply. The power cable is effectively part of the primary winding of the power transformer. The transition between the various metals used in a power cable and its connectors can cause electromagnetic reflections and diode-like rectification of the noise impulses as they propagate away from the power supply. If the power cable presents a high impedance to these signals they will be reflected back into the power supply where they will intermodulate, thus increasing the high frequency noise levels of the component. The sonic effects of this include: high background noise levels, blurred or slurred transients and a general lack of clarity and purity of the sound or visual image. To unpick this argument a little more, a mains cable will help solve this problem for the component it is connected to - but it's also my take that it can also allow other components in the system to also perform at am higher level by not having deal with rubbish coming at them from the connected component. It also goes some way to explaining why the KLEI AC cable seems to impart consistent qualities regardless of the component it is connected to - it's not just an addition to a component - it's to your system as a whole. What about a second cable? One burning question I really wanted the answer to, is how a second, third or even forth power cable would affect the sound. With the first prototype I've listened to, I could only draw comparisons with the original Eichmann cable. What we do know is that every time you make a system more transparent, any subsequent change is made more obvious. This defies the so called 'law of diminishing returns'. With interconnects and speaker cables, this quickly becomes evident. Given the experience so far, both with the KLEI cables in general and this AC cable, I hoped for a positive, cumulative and effectively compounding effect. The arrival of the second prototype threw this into sharp perspective - not only was this an obviously better cable, but the magnitude of the improvement made to my little system was greater. Every quality of both 'hifi' and music was enhanced - bass especially which is always welcome with small speakers. Both the settling and burn in changes were also made a lot more obvious but with the second cable there didn't seem to me so much of a downside - I've found new components or cables can sometimes do some pretty strange things with weird phase effects and overt brightness but this time around the process seemed more linear and predictable. You can also see that you're going to be able to maximise sound quality in a simple system for less than complex one - with one of the over performing integrated amplifier options out there, there may well only be the single component that actually plugs into the mains. So this and speaker cables are pretty much it. I'll wager that one of the KLEI AC cables will cost far less than changing either amp or speakers and will give you what I believe to be a far more certain path to improvement. Chances are you bought your present amp and speakers for good reasons and making them sound much better makes far more sense than changing one or both without first hearing them at their full potential. Of course some of us with a collection of separates are facing a little more challenge - I look at the daisy chain of turntable, power supply, phono stage, preamp, power amp and speakers and try not to add up either interconnecting or power cables. Because of the number of components I have restricted how far we have gone with cables - while I've auditioned the top end KLEI cables and know very much what they do, I also found that the tonal consistency across the range has enabled us to live happily with the entry level interconnects. The quantum of the improvement made by the AC cable is greater than that we heard from any interconnect model, so if there is going to be any priority setting, the AC cable is where we are going to head. Various mains boards have been sold as an accessory to improve sound quality or to lower interference and noise. I've never been particularly taken with any I've tried - while we do use them in the shop as a form of insurance and can accept they improve noise performance, I have found that the KLEI AC cable works its magic consistently when connected either to specialist mains boards, cheap units and just straight into the wall. This seems to confirm that the AC cable is addressing system issues just as much as in-coming factors. The one thing I will suggest with mains boards is that contacts within the sockets are probably the most important factor. Given a significant part of the performance of the plugs is the integrity of the contacts is an important part of the cable, if you do use a mains board (and the same applies to the wall socket) at leat make sure the fit is snug. The KLEI NZ configured mains plug on the cable is solid but not excessively large so will fit neatly into almost all boards, no matter how closely the sockets are spaced. I've also had one of the original Eichmann mains cables on hand for comparison - essentially there is none, but what I've also found is that the original cable is still beneficial and useful for other components - virtues of the this seems to be no downside with having two quite different designs in the one system - both are far better than standard AC cables. So if you already own one or more of these I'd not be abandoning it if there is anything you can plug it into - if anything I think the new AC cable will take your system up to a level where the virtues of the old cable are much more apparent and I'm certainly more than happy having both connected at the same time. Each allows the other to show its qualities. Unlike the original cable, I think we've got past the idea that the first place you should connect one (assuming there are options) is the component that draws the most current - what's happening is more about quality and my present thinking is that this new cable should be first tried with the component that is most often in use - this could be a phono stage, CD player, DAC or preamplifier. If we think of it as a serous upgrade to the power supply within the component, things start to make more sense. And of course any improvements you make at the start of the chain are always going to find their way through. The designation of this AC cable - gZero2 - does indicate that it is regarded as the entry level and if you are familiar with the KLEI range of cables, it is a fair assumption that the door is being left open to produce a more costly and higher performing cable - again, I've discussed their with Keith and there are plans for possibly one or two more models. I can see that there is plenty of potential with more costly materials but for now we're going to pursue our particular brand of audio socialism where we try to improve the listening experience of as many people as possible rather than only catering to the few. "Hi John. Not a full week, but 30 odd hours on the clock and already clearly brilliant. It took about an hour for their presence to become really clear but no question from then on and with the continuing improvement you anticipated. Lucidity certainly sums it up, and I can't think of a better descriptor, though I'd add an enhanced physical presence that is both subtle and pure, a more fulsome, even luminous, tone, and an improved sound stage. They make a difference I can hear from other rooms which isn't always the case at all with additional components. I'm quite convinced that two are better than one, though I've yet to test whether the second cable is best with the Oppo source or the power amp (a quick try suggested the Oppo). So far it's going extremely well with Oppo and pre-amp. And adding one of the earlier KLEI AC cables to the sub has improved the lower-end presence as well -- not by a lot and it depends on the source, but noticeable. So I'm totally convinced about the value of these latest KLEI developments and will order two more. I can only see further quality added to the system and might as well have every component working to its utmost efficiency (and start the burn-in as soon as possible). I'll let you know how I get on with power amp v Oppo sound source trials (which I take it you haven't done). Send me an invoice as usual when you're ready to despatch." "I tried one of the new AC cables with my son’s Quad Vena. It was an outstanding, instant success, transforming his whole sound as if he’d added a new amplifier, or even new speakers! The result entirely supports your claim that any system or level of production would be enhanced by the new KLEI cables. All facets of the sound were enhanced, rendering it all more transparent and tonally rich, but in particular the bass end became more detailed, more defined and more manifestly present." "It's amazing how improvements can still be made to even supposedly mundane components. Wonderful. You must be thrilled to have been able to watch (listen to) the final development stages. And yes, I love them. (And I have to say the new design is more discrete than the earlier bulbous model.) I've learnt to rely on your judgement but the impact of these cables still has to be heard to be believed. There has to be a component interaction surely, as you suggest, that's driving the effect -- I.e. not just "clean" power." You did indicate when we talked about the power cable that you were sure I would notice the difference and you were certainly correct in your assertions. No settling in or burn time on the power cord and the first record (Jazz at the Pawnshop) amazing improvement. The sound stage width and depth wow! Clarity and separation of the instruments much better. I am no Hi Fi buff and do not pretend to understand the technical jargon round the specification of equipment or ICs or speaker cables but am more than capable of hearing the differences that this power cable has brought to what already thought was a pretty good set up. I have no understanding of why a power cord can and does work magic in this regard but am very grateful that it does. If you are correct when you state that it will get better as the cable burns in and that a power cord going from the power amp will make even more improvements to my music listening then I am certainly going to pursue that in the near future after this cable has a chance to burn in a bit. Thank you John for the opportunity to try this cable prior to purchase and I certainly think that this would improve any system out there" - Iain. So - are you still with us? I can't pretend I've listened to a vast number of mains cables or attempted to define the sound of each. But from what I have heard, I think the KLEI AC cable is close to revolutionary in terms of the benefits it delivers for the price - every system or component we have connected it to in the last six weeks has been dramatically improved and while I'm still scrambling to understand exactly how and why this is so, what we hear is compelling. Even when connected to components that cost no more than the cable, the improvement is blindingly obvious. In our best systems I'd not want to ever demonstrate them without this cable being used. We've got nothing else that has anything like the same range of applications, the consistency of effect or a comparable level of value. This recommendation is not lightly given - I'm not going to throw my reputation away for a $500 cable. Keith Eichmann has produced something quite special and deserves to sell a lot of these AC cables - but more to the point, I think that you deserve the sound quality that the cable will deliver.